When we gather as a church for a worship service, a song may remind you of God’s grace or love. You may enjoy the fellowship of other believers, you may remember to pray for someone. What is it that remind you of your salvation? When God liberated the Jewish nation from slavery in Egypt. He instituted a feast by which they would remind themselves yearly of how God freed them. It is called Passover. Jewish people still celebrate this feast. Yahweh told his people to commemorate this and to pass it on from generation to generation so that they would not forget the LORD who brought them our of slavery and into a prosperous land. Jesus took bread, and broke it after giving thanks, then gave it to his disciples saying. This is my body, which is given for you. Do this in remembrance of me. This cup that is poured out for you is the new covenant in my blood. 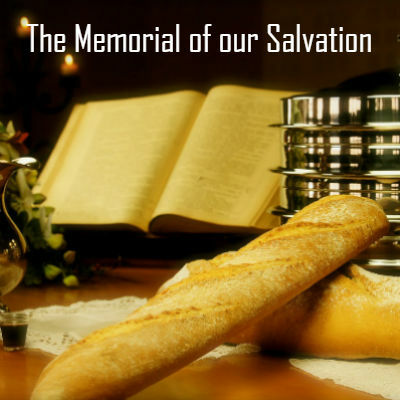 Jesus instituted a memorial by which people would remember what he did. Christians in the first century were so Christ-centered that they would always remember Jesus in their gatherings. They would eat together (break bread together) and remember their Savior in their eating and fellowshipping with each other. They too would pass on this memorial from generation to generation so that every believer in Jesus would know how they were saved. Paul received this teaching from Jesus himself and then Paul would pass it on to those he reached with the gospel. The simplicity: Jesus took bread (the very thing they were eating) Gave thanks, broke it and gave it to his disciples. The profound: This is my body which is for you. Jesus did not say that the bread becomes his body, but rather that the bread symbolizes his body. The disciples did not understand the meaning of this. Jesus gave them a preview of what would happen to him. His suffering and death. Isaiah 53:5 crushed for our sins, wounded for our transgressions. The punishment that brought us peace with God was upon him and by his stripes or wounds we are healed. The simplicity: wine, the drink they had at the meal. The profound: the cup of the new covenant. The wine symbolized Jesus’ blood. The beginning of a new area. Jesus’ death put an end the sacrificial system of the law. In the Old Covenant, every time you sinned or violated God’s law, you needed to bring blood sacrifices to atone for your sins. It is the blood of Jesus that purchased our freedom. Jesus died as the sacrificial lamb of God through whom we are saved. This simple act of eating and drinking reminds us of what Jesus did for us. It should cause us to remember the one who paid for our freedom. This memorial unlike others can take place any day. Jesus just said, whenever you do it, do it to remember him. The first Christians did it every time they came together as church. Every time they had a meal together, they took time to thank and remember the author of their salvation. The one who made possible for them to enjoy their freedom. Monuments and memorials remind you of the past, what happened in the past. The Lord’s supper deals with our present and points us to our future. Jesus paid the price, so what are you going to do about it today. Your decision will affect your future. The Lord’s supper or communion testifies to the proclamation the gospel. We will be proclaiming Jesus until he comes again, then you no longer need a reminder, no more memorials needed. In the meantime, we need to be constantly be reminded of who we are because of Jesus. We need to remember since at times we just go through the motions at church and ignore the one who made it possible that we have freedom and fellowship with God. Until Jesus comes again, we will be remembering, not just his death, his resurrection and his second coming. Never forget!